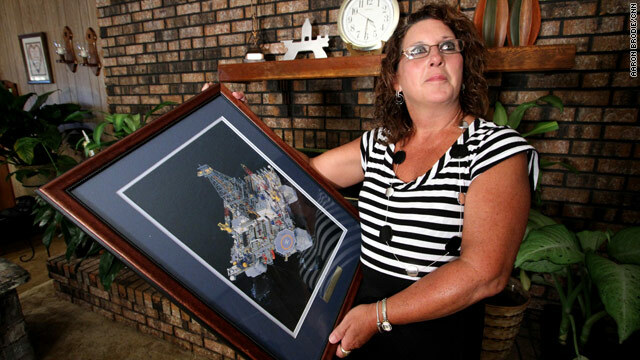 Sherri Revette holds an image of Deepwater Horizon given to the family by Transocean in memory of her husband. (CNN) -- A daughter will walk down the aisle this year without her father. A rig survivor still awakens at night and screams. A native American tribe in Louisiana now eats pork, chicken and beans instead of oysters and crab. And the voice of a Cajun musician puts everything into perspective about last year's oil spill. For years, Tab Benoit had strummed a dire tune of the pillaging of Louisiana's coast. "Before all this, you'd try to warn people about problems that were coming, and they'd think you're a conspiracy theorist," he says. "The blowout wasn't a mystery. ... It's not like it was a surprise, ya' know." A year into the nation's worst oil disaster, BP has launched a public relations campaign about "making it right." In a 20-minute video released on the company's website, group chief executive Bob Dudley sits at a polished wood table and says the disaster is a "tragedy we deeply regret at BP." "In everything we've done since that day, we've tried to act as a responsible company should," he says. "I know it will take time to win back people's respect and it will take actions rather than words. But I hope this helps to demonstrate that we are sorry, that we learned the lessons and we are committed to earning back your trust." Oil: Out of sight, out of mind? The video then chronicles BP's efforts to contain the spill in the days, weeks and months following the April 20, 2010, explosion on the Deepwater Horizon offshore drilling platform. The plume of crude billowing into the Gulf of Mexico has stopped, and images of oil-soaked birds have subsided. But take a closer look at the Gulf region and you'll find shattered lives and angry -- yet determined -- residents. "Just wishing that Dewey was there," says Sherri Revette, his wife of 26 years. Little things like cleaning the gutters or buying a lawnmower became monumental tasks over the last year. "I don't know what to do," Sherri says. "I have to try to figure out a way to be excited and not sad," Sherri says. "That was one of our main dreams, and he wanted a grandson so bad." Their youngest daughter, Alicia, always hoped her dad would walk her down the aisle. This October, she'll be getting married. "It's going to be hard," Sherri says, "on the happiest day of her life, knowing her father's not going to be there." After Sunday's fish fry, Sherri took friends and relatives to a nearby cemetery where a headstone for Dewey rests. On the back, there's an image of Deepwater Horizon "so 100 years from now, the next generations will remember that Dewey was one of the 11 on the rig." "He's missed, and I'm just taking it one day at a time," she says. "We lost 11 good men that shouldn't have been lost." She repeats: "It should never have happened." Matthew Jacobs wakes up screaming in the middle of the night. He was among the 115 survivors of Deepwater Horizon. "It's something that I just can't get out of my head," he says. Every day, he thinks about his 11 colleagues killed on the rig. "My mind goes right back to the drill floor," he says, "and the 11 men." According to his medical records, Jacobs has been diagnosed with post-traumatic stress disorder, and he takes medication for depression, sleep problems and other issues. He visits psychologists regularly. We lost 11 good men that shouldn't have been lost. He says he's undergone 10 weeks of physical therapy for bulging discs in his back. "It's basically changed my life completely since this happened," he says. "Certain things I don't do because I just don't feel comfortable. I love fishing and I just don't feel comfortable doing it because it's on the water. I'm really claustrophobic now and I feel it every time I get in the elevator." Jacobs is still an employee of Transocean, which owned the Deepwater Horizon, but hasn't worked on a rig since the disaster. He says he'll never work offshore again. He's suing Transocean for pain and suffering and loss of wages. At the end of last year, when Transocean gave bonuses to employees and touted a stellar safety year, Jacobs says, "It made me sick to my stomach." Transocean later apologized for its handling of the bonuses, and five top executives said they would donate their safety bonuses to the families of the 11 workers killed. "You have to live your life now taking medicine every day to try to keep the nightmares from coming back," he says. "It's always in the back of your mind, and I think about it every day." "It changed our way of life for sure," says tribe member Theresa Dardar. "We're not eating like we usually eat." Her family used to eat seafood every day. Now, they eat shrimp only on Fridays. The rest of the week, it's chicken, pork and beans. She says she hasn't had an oyster since "before the spill." That especially hurts because she longs for the oysters of the past. "We love fresh oysters," she says. "My husband even more so. He was tempted to get some recently, but he said no, he wouldn't take a chance." Dardar says the tribe had independent tests conducted on local shrimp, oysters and crab -- and the results showed some were tainted. "We don't trust the tests that the state and federal governments did." The Food and Drug Administration and the National Oceanic and Atmospheric Administration have consistently said thousands of tests "prove Gulf seafood is safe from oil and dispersant contamination." On a recent French Quarter spring morning, with the sun shining and the birds singing, Al Sunseri struggled to be cheerful. A year ago, just after the spill, he was still hanging on as best he could to business as usual. After all, P&J Oyster Company had survived a lot of calamities in its 135-year history. He was certain it could weather this one. Now, he's not so sure. "This was always full," he says, pointing to cold storage rooms that now gape empty. "Lots of activity going on. Shuckers lined up along this stall. We had around 20 employees, give or take a few." Today the company is down to Sunseri, his brother, and a few part-timers. Rather than reeling in the magnificent hauls of fresh Louisiana oysters prized by top chefs, they now spend almost all their time buying and re-selling oysters from other Gulf states where the impact was less devastating. And they fume about BP's promises to make everything right in the wake of the spill. "I expected them to follow through on that," he says, standing near a now-unused processing table. "As time went on, I found out that isn't what was occurring. And I've become angry." Although his attorney won't let him talk numbers, Sunseri says his business has been reduced to a small fraction of what it once was. A claim filed in November with the Gulf Coast Claims Facility, the agency set up to handle claims for BP, has finally produced a check, but Sunseri says it was for far less than what he has lost. The top Gulf Coast Claims Facility official, while declining to comment directly on that case, says the organization is continuing to address such complaints and concerns. Still, for Sunseri, a future that seemed assured before the spill remains in limbo. He wonders when the market for Gulf seafood will bounce back; he wonders how the Louisiana oyster beds will recover; and he wonders if he will ever see the day when he can truly say the oil spill is a thing of the past. When brown tar balls began to wash up on the white-sand beaches of Destin and Fort Walton Beach, Florida, last year, county officials weren't willing to wait for BP, the Coast Guard or any other agency to make it stop. Okaloosa County officials attracted national attention when they went against federal plans and added skimmers, barges, extra oil-absorbing boom and an air wall to push oil away. They estimated it could cost about $6 million per month in funds they didn't have, but they refused to wait on what they saw as bureaucracy and reactive safety procedures. The move "actually worked to our advantage. It forced the issue with the Coast Guard, BP, everybody," said Wayne Harris, chairman of the Okaloosa County Commission. The good news? "We didn't need it, thank God." Relatively little oil landed on their beaches, and it never took over the fresh-and-salt water Choctawhatchee Bay. This year, at least, the parasailing, jet skiing and fishing is back, along with expanded service on Vision Airlines, Harris said. Still, the county is considering joining a lawsuit related to a "nightmare" claims process and is slowly rebuilding after fear of oil rocked the tourism economy. Harris said his constituents supported county officials' decision to stop oil at any cost, and they're still hanging with them one year later. "I'm thankful the commission had the strength of character to do what's right," Harris said. "You ask if I'd do it again -- you're damn right I would." In the weeks and months after the oil disaster, Beth Meeks saw her business boom. Given her job as executive director of the Louisiana Coalition Against Domestic Violence, that was horrible news. Shelters filled up, programs lost funding and hot line calls grew on a whole by 20% -- the majority coming from the southern part of the state closest to the Gulf. But as she said then -- and reiterates now -- the disaster didn't create abuse where it didn't exist before. The fact that offenders were out of work, experiencing heightened stress and spending time at home around those they abused made matters worse. A year later, Meeks says survivors of domestic violence are still coming to shelters and reaching out for help in waves. As delayed layoffs occurred and savings dried up, the stress may have hit families at different times, she says. The overall need, Meeks says, has been enormous, with some programs now reporting a 50 to 80% increase in phone calls and shelter bed use. She oversees 20 state-funded domestic violence programs, 14 of which are in the southern part of the state and most affected by the oil disaster fallout. Among those, she says, half are reporting higher rates of substance abuse and two-thirds are noting increased levels of depression in survivors, with more asking for mental health services. At the same time, anecdotally, programs are also hearing from survivors about a more rapid escalation in violence, as well as greater severity of violence, meaning more emergency-room visits. The passage of time has compounded the problems for many, Meeks says. And all of this comes just as donations from individuals -- in many cases people tied to the fishing or oil industries -- have plummeted. While the United Way used to be a big source of financial support, its help took a nosedive because the organization relies on local communities and corporations that often match employee gifts. BP, meantime, provided $500,000 to domestic violence shelters, Meeks says, but that funding didn't make up for the money programs lost. The program that benefited most from BP dollars received no more than $80,000, she says, but it lost $100,000. Many programs have cut staff. The BP support runs out in June, Meeks adds. "No one knows what will happen then." When Cajun musician Tab Benoit strums a tune, he wants people to listen. He'd been warning people for years about the deteriorating Louisiana wetlands, the deterioration's harmful consequences and what he perceived as a lack of concern by Big Oil, government and the public. "Now, here we are," he says, "we get to use the coast of Louisiana as an example of the front line of change you don't want. That kind of rolls everything up into a nutshell, ya' know." Benoit lives out in the bayou. Before he became a musician, he was a pilot who flew pipeline patrol. "You'd see a problem down there, report it and it wouldn't get fixed." "I'm not angry at BP," Benoit adds. "I'm angry at us. ... It's given me more information to get the public aware of these things. When something like this happens, people around the country go: What's gong on down in Louisiana?" He says what's happened in Louisiana is a microcosm of complacency in America. "Without public pressure, there is no power. And we continue to get steamrolled by big corporations. It's not just oil. It's across the board." That, he says, is the real wake-up call. "My goal is to try to get the public off their butts," he says. "To me, that's bigger and more powerful than the oil itself." CNN's Wayne Drash, Chuck Haddad, Tom Foreman, Jamie Gumbrecht and Jessica Ravitz contributed to this report.